A nice overclocked model too. This is getting silly now—and awesome. We've been seeing prices drop on the RX 480 for several weeks now, especially as news and rumors about AMD's next graphics card Vega heat up. We keep thinking prices have bottomed out - last week £190 was the best price, £200 the week before that. This week, prices have dropped yet again, and you can get an 8GB RX 480 for just £183 at AWD-IT. Back when the RX 480 released in June of 2016, you could be spending £240 on a brand new RX 480. Just eight months later, and prices on some models have dropped well below £200. 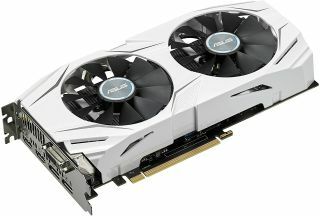 For £183 you'll get an Asus Dual RX 480 OC, and not only is this the cheapest RX 480 we've seen, it's also one of the more powerful options available. Asus makes graphics cards with multiple modes which alter the clock speed, and in Gaming Mode, you'll get 1305MHz, while in OC Mode, you'll get a hefty 1325MHz. Pretty nice upgrades over the 1120MHz / 1266MHz base / boost clock speeds found on the reference card. You'll also get Asus' custom dual fan cooling system, which it says provides way more air pressure and is 3x quieter than the reference. As for ports, you'll get a DVI, two DisplayPort, and two HDMI (handy for VR). As usual, check out our review of the RX 480 if you want to know why it's so good for the price. At this rate, you might want to wait a few weeks, they'll probably be below £100 by then (they won't).